This year’s awards would not have been possible without our event sponsor MasterCard, and award sponsors Watterson Marketing Communications, NEC, the Australian Computer Society, Data61 and Linksys. One major winner was Allure Media’s Kotaku Australia, which earned a total of three awards on the night, whilst the Best Gaming Journalist gong also went to Kotaku’s Mark Serrels. Fairfax Media also walked away with the Best News Coverage award in addition to Best Business Coverage for the Australian Financial Review. 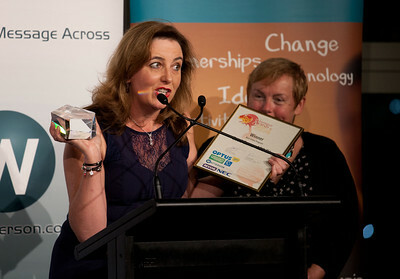 Several categories were also successfully defended, including Best Audio Program by Download This Show, Best Video Program by Good Game, Best Magazine by CRN, Best Independent Media by Ausdroid, Best Technology Industry Journalist by Caitlin Fitzsimmons, Best Business Technology Journalist by Allie Coyne, and Best Media Relations by Matthew Wu. MediaConnect is delighted to announce the individual finalists for the 14th annual MasterCard IT Journalism Awards, recognising outstanding work produced in the year of 2015. All those who entered or judged this year’s awards are invited to attend the awards as guest of our principal sponsor, MasterCard. The awards will be held at the Crystal Ballroom in Luna Park, Sydney on Friday May 13th, with doors opening for pre-dinner drinks at 6:30PM. The Awards commence from 7:00PM. In addition to MasterCard, this year’s awards are sponsored by Watterson Marketing Communications, NEC and the Australian Computer Society - and we thank them greatly for making this event possible. Linksys is also supporting the awards. The IT journalism community has once again enthusiastically participated in this years awards, bringing in a record amount of over 300 entries across a number of categories. The most popular category was Best Gaming journalist with 38 submissions, just in front of Best Columnist and Best Consumer Technology journalist. So congratulations if you're a finalist, and best of luck next Friday. And if you didn’t get a finalist berth, we hope you can still join us to support your IT Journo peers and brethren. If you require additional tickets tickets to the event, please visit our Lizzies site to purchase a ticket. Shortlisted finalists are announced only for all individual/journalist categories (in alphabetical order). Media categories include all nominees as listed below. If any entrants or judges have not received or misplaced their invite, please contact Craig Daveson on craigd@mediaconnect.com.au. ​​The 2016 Tech Leaders Forum will return to the Blue Mountains on March 13 & 14 with a special focus on innovation and IT transformation. MediaConnect CEO Phil Sim said that Tech Leaders was now accepting RSVPs from interested IT and business media, analysts and influencers, as well as technology companies wanting to present at the event. Journalists who cover IT or business can click here to express their interest in attending. “We had great feedback from last year’s event both so we’re returning to the Fairmont Resort with a program similar to last year’s successful format,” Sim said. “With the heightened interest in how Australia can modernise its economy, we expect this year’s Tech Leaders to have a strong focus on innovation and IT transformation,” Sim said. Other likely topics include ICT policy, security, cloud computing, telecommunications and the Internet of Things. Tech Leaders is a two-day conference, in its 14th year, that brings together Australia and New Zealand’s most influential IT and business media to meet and hear from IT vendors about the trends that are likely to face the year ahead. “We’re also looking to involve analysts, influential IT pros and other key tech and business identities because we want to encourage really robust and interesting topics with a diverse guest list,” Sim said. Tech Leaders has always attracted high profile keynote speakers, and in recent years Prime Minister Malcolm Turnbull, ICT Shadow Minister Jason Clare, Senator Scott Ludlam, MP Paul Fletcher and Australian Federal Police Assistant Commissioner Tim Morris have all presented at the event. Sim said that Tech Leaders’ 14 year history proves that participating companies derived enormous value from the event with many companies returning year-on-year. “Tech Leaders is the one event where media and vendors take those couple of days out of their schedule to all get together in the one place, build or nurture relationships, improve their understanding of the industry and really get an amazing amount done in a really short space of time,” Sim said. Interested companies can find out more by calling (02) 9894 6277 or emailing info@mediaconnect.com.au to request the information brochure. ​The Australian’s Supratim Adhikari will make the trek to Sydney to present at MediaConnect’s upcoming Media Insights seminar. This year, Media Insights will be held at the Harbourview Hotel in North Sydney on Tuesday, September 29th. The aim of the day is to help PR professionals better understand the technology media landscape and how to work with influential technology journalists. As well as having the chance to sit down and quiz some of Australia’s most influential technology journalists about pitching preferences and needs, attendees will learn about key IT media topics including the reviews process, tech bloggers, the IT channel and technology in business media. In all, we expect around 20 presenters to speak at the event. This will be the tenth Media Insights seminar, with the event having run since 2007 and in that time more than 200 PR professionals have graduated from the seminar, said MediaConnect CEO Phil Sim. To reserve your place at Media Insights 2015 or find out more please call us on (02) 9894 6277 or email Craig Daveson at craigd@mediaconnect.com.au. Any journalist that is interested in participating can also contact Craig Daveson, with the full program and participating speakers to be released within the next fortnight. ​MediaConnect’s upcoming Tech Leaders Forum will tackle Australia’s proposed data retention legislation from two very different angles at the 2015 event which will be held at the Fairmont Resort in the Blue Mountains on February 22 and 23. Our opening keynote will be delivered by Assistant Commissioner Tim Morris, who is the national manager for the Australian Federal Police’s High Tech Crime Operations. Assistant Commissioner Morris will be discussing both the law enforcement community’s need for data retention as well as the broader role of the AFP’s High Tech Crime Operations. On Sunday afternoon, Greens Senator Scott Ludlam will close the day’s proceedings. Senator Ludlam will also be discussing the data retention legislation, and why he believes the proposed legislations should be opposed. The Tech Leaders Forum 2015 will be attended by approximately 40 of Australia and New Zealand’s most influential technology journalists, with the goal of discussing the emerging issues facing the technology sector in the upcoming year. Technology vendors and service providers have the opportunity to brief and network with this select gathering of influential media in a hugely time-effective and productive setting. There are still openings available for companies to present and more information can be found at TechLeaders.com.au or by calling Mike Woodcock on (02) 9894 6277.